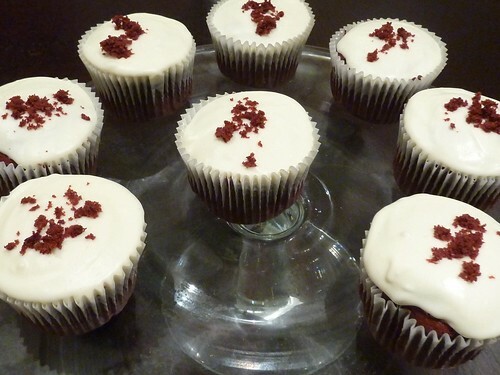 Red velvet cakes are an american tradition with cream cheese frosting. They were made famous in the film Steel Magnolias when they were featured as a wedding cake and are a very popular cake made by The Hummingbird Bakery. 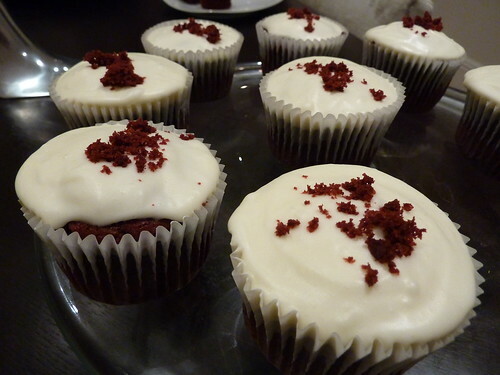 Below is a recipe for red velvet cupcakes with cream cheese frosting. Beat the butter and sugar together using an electric whisk until light and fluffy. Add the eggs one at a time and continue to beat together. In a separate bowl mix together the cocoa, vanilla essence and food colouring. It does seem a lot of food colouring but dont worry about it! Mix them together so that it becomes a dark coloured paste. Add to the butter/sugar/egg mixture and beat together. Then add half of the buttermilk, beat together, add half the flour, beat together and then repeat this process. You will then just have the bicarbonate of soda left. Add this and beat slowly to start with and then increase the speed so that everything is mixed together and you should have a lovely deep red mixture. Divide between the muffin cases - this recipe should make about 18 cupcakes. Fill the cases about 2/3 full. Bake on the middle shelf of the oven for around 20 minutes on 170C or 325F or gas mark 3. The cakes should be springy to the touch when properly cooked. Remove and cool on a wire rack. Beat together the sugar and butter with the water. Then add all of the cream cheese and beat together until smooth and glossy. Add the vanilla essence and mix together. Using a spoon top the cupcakes with the frosting. A nice touch is to crumble one of the cupcakes and sprinkle a little of the crumbs on top of the cake for decoration. Try and use a deep muffin tin if you have one - this keeps the cupcakes in shape in their muffin cases while cooking. Don't be put off by the amount of food colouring that is required - it gives the cake the deep red colour. Deeeeeeeeeeelicious! Tried them today for a Halloween Party (Green Creamcheese frosting!) and I was super impressed by how moist and crumbly they are! No mean feat...my people are firm Magnolia Bakery vanilla cupcake fans courtesy of another friend! I love these, I make them all the time. However, I have never been able to get the buttermilk so I substitute this for Natural Yogurt, does the trick. If you don't have that then some full fat milk can also be used. Thank you for giving measures I'm used to baking to, I have the Humming Bird cook book and I struggle to measure items with the cup system. Helloooo....since finding your blog a year ago i have been making these at EVERY opportunity i can get! This is probably the best recipe ive ever tried, there are millions of different variations, but for me, yours worked the best! Just a quick question....if i wanted to make 24 cupcakes, how would i alter the measurements? i usually make 18 cupcakes along with about 8-10 mini cupcakes with your recipe...i follow it down to a T but am scared to guess measurements for 24 cupcakes unless i get it wrong....please help, many thanks! You can make buttermilk by mixing one tablespoon of lemon juice or white vinegar and a "cup" of milk and leaving for 5 mins. Worked well for me. Good cupcakes, thanks. Great recipe will definitely be making these. Shame you are not still updating your blog. made these last week for my family who had never had a red velvet cupcake before and they went down a treat. The look on my daughters face as she realised they were red was a picture! !Can't wait to make them again for the rest of my family. will be trying your whoopie pie recipe next. If you can't get hold of buttermilk will using soured cream work? I gave this recipe a try for the first time a week ago..... I LOVE IT!! So much so, that my kitchen now looks like a cupcake factory! I have experimented and added 1 teaspoon of finely ground mixed spice to the icing..... Instant Christmas!!! I'm making tons for gifts!...... A little bit of edible glitter with a fondant/icing holly leaf and berries on top and they look and smell 100% festive! These are the best cupcakes ever ! Just posted about mine :) take a look! Awesome!!!! This was my first attempt at cupcakes. 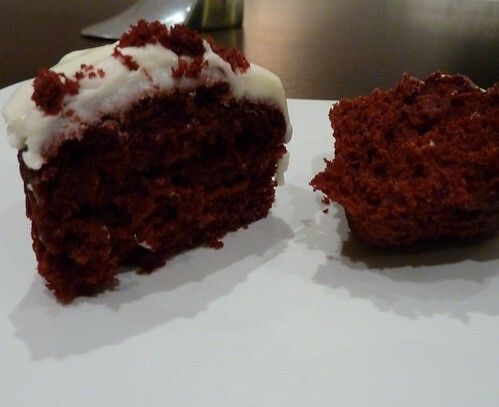 Your recipe was simple and easy to follow... and as for the cakes... most yummy:-) Loved the deep red colour. They were the hit of the party!! will diffidently be making these again! !